Cytocare 532 is a skin booster solution intended to effectively improve the appearance of aging signs like dehydration, lack of radiance and fine lines. Non-cross-linked hyaluronic acid and rejuvenating complex CT50 replenish moisture and promote synthesis of collagen fibers. Hence, aging signs are erased for radiant skin. What is Cytocare 532 formulated to do? Cytocare 532 is intended to revitalize skin affected by early signs of aging such as dehydration, dullness and wrinkles. Non-cross-linked hyaluronic acid floods the skin with much-needed moisture while rejuvenating complex CT50 is packed with skin curative and protective ingredients like Retinol and Vitamin E. Once injected, the solution encourages better growth of collagen fibers while protecting superficial skin layers from oxidizing agents. As a result, imperfections are repaired for a luminous and youthful skin. The manufacturer behind this innovative product is Laboratories Revitacare, a French company. The skin revitalizing solution is made in France. Mild side effects like localized inflammatory reactions (e.g. pain, swelling, redness, itchiness) may emerge following treatment session. These reactions will subside in a few days. Skin damaged by early signs of aging such as dullness, dehydration, superficial wrinkles and loss of density can be effectively remedied using this dermal booster solution. The skin rejuvenating booster is supplied in 5ml vials. Cytocare range contains two other products which are Cytocare 502 and Cytocare 516. All these skin restoring solutions have a varying concentration of non-cross-linked hyaluronic while maintaining the biorejuvenating complex CT50 at the same concentration. These other solutions are more suitable for preventing and correcting skin affected by aging signs. Just before injections, thoroughly disinfect the problematic areas and assemble the medical device. Once ready, inject the biorevitalizing solution into the superficial or middle dermis layer of skin gently. For best results, use point by point, fanning, cross-hatching, or retrotracing injection techniques to administer the product. 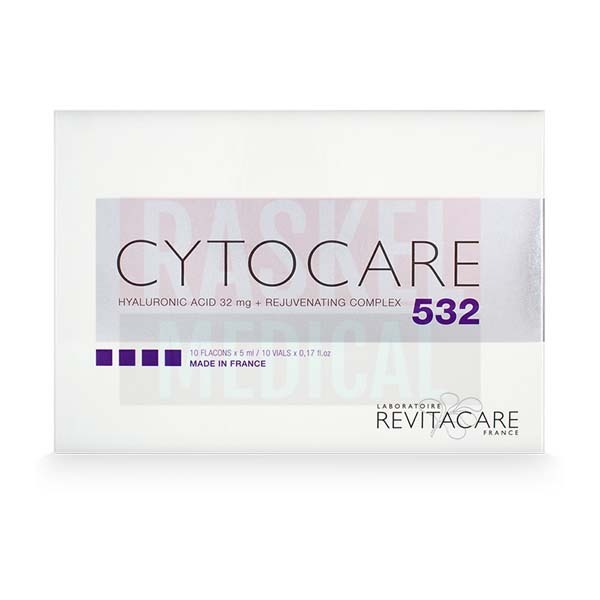 Cytocare 532 contains 32mg of non-cross-linked hyaluronic acid to deeply moisturize dehydrated tissues. It is also rich in bioactive ingredients, also known as Rejuvenating Complex CT50. Together, these two group of constituents encourage fibroblasts to generate sturdier collagen fibers for strengthened skin. Not only that, the skin is protected from further damages. Following successful treatment, skin becomes more elastic, well-hydrated and radiant. Rejuvenating Complex CT50: Retinol, Thiamin, Riboflavin, Nicotinamide, Dexpanthenol, Pyridoxine, Ascorbic Acid, Ergocalciferol, Tocopherol, Ammonium Molybdate, Ammonium Metavanadate, Calcium Chloride, Iron Sulfate, Potassium Chloride,Copper Sulfate, Magnesium Chloride, Manganese Sulfate, Sodium Acetate, Sodium Hydrogen Carbonate, Sodium Chloride, Sodium Hydrogen, Phosphate, Sodium Metasilicate, Sodium Selenite, Nickel Chloride, Tin Chloride, Zinc Sulfate, Alanine, Arginine, Asparagine, Aspartic Acid, Cysteine, Glutamine, Glutamic Acid, Glycine, Histidine, Isoleucine, Leucine, Lysine, Methionine, Phenylalanine, Proline, Serine, Threonine, Tryptophan, Tyrosine, Valine, Adenine, Biotin, Calcium Pantothenate, Choline Chloride, Folic Acid, Inositol, Nicotinamide, Pyridoxine, Riboflavin, Thiamine, Vitamin B12, Deoxythymidine, Glucose, Putrescine, Sodium Pyruvate, Lipoic Acid. 10 vials of 5ml, Package insert. Initially, patients are treated every three weeks for the first three sessions. Afterwards, patients only need to receive maintenance injections every three months to preserve the desirable results of procedure. Please store the injectable solution in a place with regulated temperature between 2℃ to 25℃. Refer to the package expiry date.